Israeli PM to military: "Take off the gloves"
JERUSALEM -- The Israeli military launched what could be a long-term offensive against the Hamas-ruled Gaza Strip on Tuesday striking about 150 targets in the Gaza Strip, according to Israeli Defense Forces (IDF). At least 15 Palestinians, including three children, were killed in the attacks from air and sea, Palestinian medical officials said. CBS Radio News correspondent Robert Berger says, in addition to the airstrikes, Israel is clearly mobilizing for a possible ground offensive aimed at stopping a heavy barrage of rocket attacks against Israel: 1,500 Israeli reservists have been called up and tanks and artillery have been deployed along the Gaza border. "It won't end in a day and it won't end in two days. It will take time," Yitzhak Aharonovitch, the country's Cabinet minister for internal security, told Channel 2 TV, during a visit to the rocket-scarred southern city of Ashkelon. "If we need to go inside in a ground operation, then we will do it. These things are on the table. These options exist. We will not stop anything until the rocket firing ends," he added. Asked whether there were any efforts to reach a cease-fire, Aharonovitch said, "Not now." The Israeli cabinet approved on Tuesday a call up of 40,000 more reserve troops. The army said there were no immediate plans to call up the troops but that they would be activated depending on operational needs. Prime Minister Benjamin Netanyahu met with the heads of his security agencies Tuesday at the Kirya base in Tel-Aviv for consultations. He instructed the commanders to "take off the gloves" in their fight against Hamas. 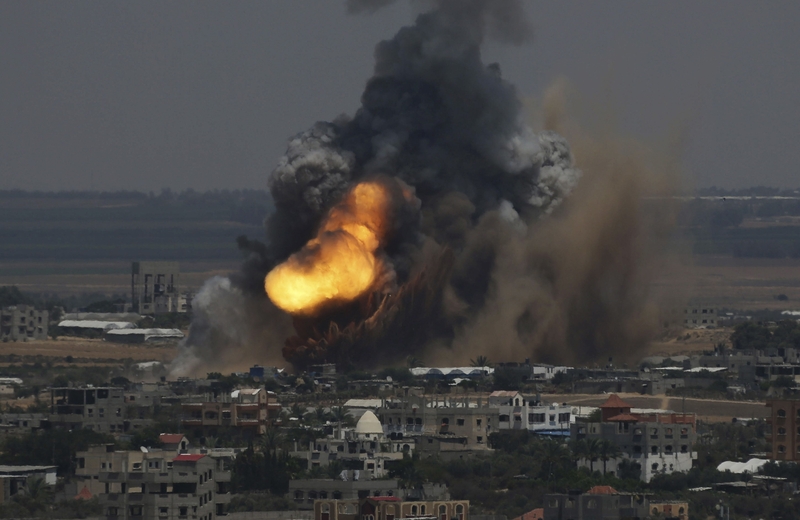 "Hamas chose escalation and it will pay a heavy price for it," said the Israeli leader. The army said its offensive, dubbed "Operation Protective Edge," was aimed at striking Hamas and ending the rocket fire that has intensified in recent weeks amid tensions over the killing of three Israeli teenagers and the apparent revenge killing of a Palestinian teenager. CBS News' Holly Williams says Israel's army claims it's restoring stability by destroying the infrastructure of Hamas -- the militant group that's now claimed responsibility for the surge in rocket attacks on southern Israel. After a brief early morning lull Tuesday, the rocket fire from Gaza resumed with more than 15 rockets fired toward southern Israel, including the cities of Ashdod and Ashkelon. Associated Press video footage showed launches from inside Gaza residential neighborhoods. In a statement the IDF said a total of 130 rockets have been launched at Israel since Monday evening. The military said five of the projectiles were intercepted by the country's sophisticated Iron Dome missile defense system. One barrage set off air-raid sirens in Tel Aviv, some 45 miles away, signaling the deepest strike yet. The army said the rocket was intercepted and shot down. The siren set off panic in Tel Aviv, the country's commercial capital, as people scurried for cover in nearby buildings. Israel's Channel 2 quoted senior Hamas leader Ismail Al-Ashkar as saying in a written statement that the militant group was ready for a months-long confrontation with Israel, and armed with rockets capable of reaching beyond Tel Aviv. The military said it had targeted four houses belonging to Hamas militants involved in launching rockets at Israel or other militant activity. Palestinian medical official Ashraf al-Qidra reported at least 15 people dead, including at least five civilians. Among the dead were six people, including two children, killed in an airstrike that flattened the concrete home of a Hamas leader in the southern town of Khan Younis, Hamas officials said. The blast set off a scene of panic as crowds of people, some of them bloodied, fled the smoldering remains. Screaming Palestinians took away motionless bodies, including what appeared to be the two children. A separate airstrike on a motorcyclist killed two people, including a young boy who was passing by, al-Qidra said. Late Tuesday, Israeli troops shot and killed four militants who tried to infiltrate a military base in southern Israel by sea. Lt. Col. Peter Lerner, a military spokesman, said the attackers made it ashore and attacked the base with grenades and assault rifles. An Israeli soldier was lightly wounded. Lerner said Israeli forces were searching the area for other attackers. Hamas claimed responsibility for the attack. Israeli officials also said a drone strike in Gaza on Tuesday killed four people travelling in a car, including a man identified as Hasan Shaabad, the alleged commander of Hamas' maritime commando unit. Israel's defense minister announced a special state of emergency in the region Tuesday as summer camps and kindergartens were shut down and residents were encouraged to stay close to their homes. The military ordered hundreds of thousands of Israelis within a 25-mile radius of the Gaza Strip, including Israelis in the major southern city of Beersheva, to stay indoors and near shelters. The moves came after President Obama called on Israelis and Palestinians alike to show restraint and put an end to acts of retribution. The remarks Monday were some of his first public comments on the matter since the teens' murders touched off a new round of violence and deepening mistrust. The charged climate inspired Mr. Obama to pen an op-ed for the Israeli newspaper Haaretz. He called it a "dangerous moment" for the region where a vaunted U.S. peace effort recently collapsed. Writing in emotional terms, he said he couldn't imagine the pain suffered by the parents of the three Israeli teens, but was also heartbroken by the senseless murder of a Palestinian teenager who many suspect was killed as payback.